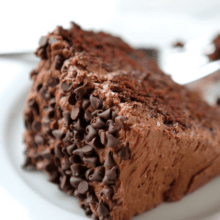 This Perfect Chocolate Cake Recipe is easy to throw together, uses common everyday ingredients and tastes amazing! You will never need another recipe again. Guaranteed. Preheat oven to 350 degrees. Line 2 8-inch round cake pans with parchment paper. Lightly spray with non stick cooking spray and set aside. In a large bowl, whip oil and sugar together. Stir in vanilla. In a measuring cup, stir almond milk and vinegar together. Set aside to curdle. In a different bowl, stir all dry ingredients together until evenly mixed. Alternate mixing in wet and dry ingredients to the batter starting and ending with dry. Pour evenly into prepared pans and bake 20 minutes or until toothpick comes out with a few moist crumbs after being inserted. Cool 15 minutes, then remove cakes from warm pans to cooling rack. Cool completely. After cakes are cooled, make a batch of chocolate frosting. Be sure to whip it well, scrape the sides well and use room temperature butter. To assemble, stack baked cakes one on top of the other, filling with frosting. Using remaining frosting, cover the entire outside and top of the cake. Cover the edges with mini chocolate chips and serve. To bake in 9x13 pan, spray glass pan with nonstick cooking spray and bake 25-30 minutes or until toothpick comes out clean once inserted. To bake cupcakes, line 24 muffin tins with paper liners, fill 2/3 of the way full and bake 15 minutes.